Sound penetrates our life everywhere. It is an essential component of our social life. We need it for communication, orientation and as a warning signal. The auditory system is continuously analyzing acoustic information, including unwanted and disturbing sound, which is filtered and interpreted by different cortical (conscious perception and processing) and sub-cortical brain structures (non-conscious perception and processing). The terms “sound” and “noise” are often used synonymously. Sound becomes noise when it causes adverse health effects, including annoyance, sleep disturbance, cognitive impairment, mental or physiological disorders, including hearing loss and cardiovascular disorders. The evidence is increasing that ambient noise levels below hearing damaging intensities are associated with the occurrence of metabolic disorders (type 2 diabetes), high blood pressure (hypertension), coronary heart diseases (including myocardial infarction), and stroke. Environmental noise from transportation noise sources, including road, rail and air traffic, is increasingly recognized as a significant public health issue. – Short-term laboratory studies carried out on humans have shown that the exposure to noise affects the autonomous nervous system and the endocrine system. Heart rate, blood pressure, cardiac output, blood flow in peripheral blood vessels and stress hormones (including epinephrine, nor-epinephrine, cortisol) are affected. At moderate environmental noise levels such acute reactions are found, particularly, when the noise interferes with activities of the individuals (e.g. concentration, communication, relaxation). – Noise-induced instantaneous autonomic responses do not only occur in waking hours, but also in sleeping subjects even when they report not being disturbed by the noise. – The responses do not adapt on a long-term basis. Subjects who had lived for several years in a noisy environment still respond to acute noise stimuli. – The long-term effects of chronic noise exposure have been studied in animals at high noise levels showing manifest vascular changes (thickening of vascular walls) and alterations in the heart muscle (increases of connective tissue) that indicate an increased aging of the heart and a higher risk of cardiovascular mortality. – Long-term effects of chronic noise exposure in humans have been studied in workers exposed to high noise levels in the occupational environment showing higher rates of hypertension and ischemic heart diseases in exposed subjects compared with less exposed subjects. These findings make it plausible to deduct that similar long-term effects of chronic noise exposure may also occur at comparably moderate or low environmental noise levels. It is important to note that non-auditory noise effects do not follow the toxicological principle of dosage. This means that it is not simply the accumulated total sound energy that causes the adverse effects. Instead, the individual situation and the disturbed activity need to be taken into account (time activity patterns). It may very well be that an average sound pressure level of 85 decibels (dB) at work causes less of an effect than 65 dB at home when carrying out mental tasks or relaxing after a stressful day, or 50 dB when being asleep. This makes a substantial difference compared to many other environmental exposures where the accumulated dose is the hazardous factor, e. g. air pollution (“dealing with decibels is not like summing up micrograms as we do for chemical exposures”). The general stress theory is the rationale and biological model for the non-auditory physiological effects of noise on man. According to the general stress concept, repeated temporal changes in biological responses disturb the biorhythm, cause permanent dysregulation, resulting in physiological and metabolic imbalance and disturbed haemostasis of the organism leading to chronic diseases in the long run. In principle, a variety of body functions may be affected, including the cardiovascular system, the gastrointestinal system, and the immune system, for example. Noise research has been focusing on cardiovascular health outcomes because cardiovascular diseases have a high prevalence in the general population. 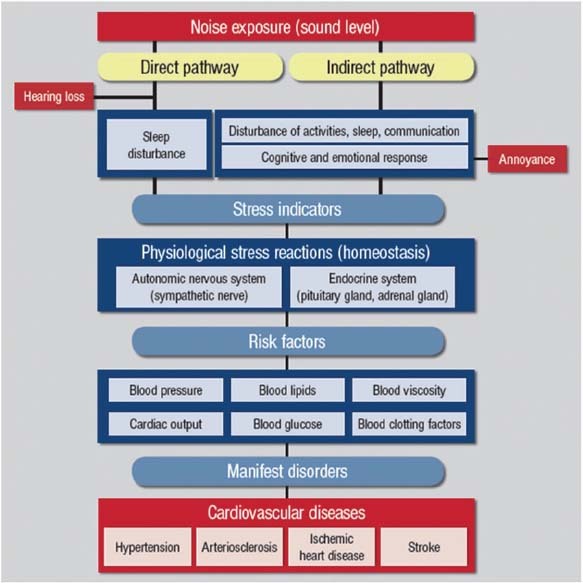 Noise-induced cardiovascular effects may therefore be relevant for public health and provide a strong argument for noise abatement policies within the global context of adverse health effects due to community noise, including annoyance and sleep disturbance. Figure 1 shows a simplified reaction scheme used in epidemiological noise research. It simplifies the cause-effect chain i.e. : sound > disturbance > stress response > (biological) risk factors > disease. Noise affects the organism either directly through nervous interactions of the acoustic nerve with other regions of the central nervous system, or indirectly through the emotional and the cognitive perception of sound. The objective noise exposure (sound level) and the subjective noise exposure (annoyance) may both be predictors in the relationship between noise and health endpoints. The direct, non-conscious, pathway may be predominant in sleeping subjects. The body of epidemiological studies regarding the association between transportation noise (mainly road traffic and aircraft noise) and cardiovascular diseases (hypertension, coronary heart disease, stroke) has increased a lot in the recent years. Most of the studies suggest a continuous increase in risk with increasing noise level. Exposure modifiers such as long years of residence and the location of rooms (facing the street) have been associated with a stronger risk supporting the causal interpretation of findings. The question is no longer whether environmental noise causes cardiovascular disorders, the question is rather to what extent (the slope of the exposure-response curve) and at which threshold (the empirical onset of the exposure-response curve (reference level)). Different noise sources differ in their noise characteristics with respect to the maximum noise level, the time course including the number of events, the noise level rise time of a single event, the frequency spectrum, the tonality and their informational content. In principle, different exposure-response curves must be considered for different noise sources. This not only applies to noise annoyance where aircraft noise is found to be more annoying than road traffic noise and railway noise (at the same average noise level), but may, in principle, also be true for the physiological effects of noise. So called meta-analyses have been carried out pooling the results of relevant studies on the same associations for deriving common exposure-response relationships that can be used for a quantitative risk assessment. Figure 2 shows pooled exposure-response relationships of the associations between road traffic noise and hypertension (24 studies, weighted pooled reference level 50 dB), road traffic noise and coronary heart disease (14 studies, weighted pooled reference level 52 dB), aircraft noise and hypertension (5 studies, weighted pooled reference level 49 dB), and aircraft noise and coronary heart disease (3 studies weighted pooled reference level 48 dB). Conversions of different noise indicators were made with respect to the 24-hour day(+0 dB)-evening(+5 dB)-night(+10 dB)-weighted annual A-weighted equivalent continuous sound pressure level Lden which is commonly used for noise mapping in Europe and elsewhere, referring to the most exposed façade of the buildings. 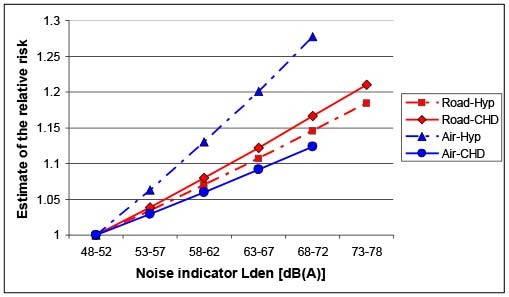 The curves suggest increases in risks (hypertension, coronary heart disease) between 5 and 10 percent per increase of the noise indicator Lden by 10 dB, starting at noise levels around 50 dB. This corresponds with approximately 10 dB lower night noise levels Lnight of approximately 40 dB. According to the graphs, subjects that live in areas where the ambient average noise level Lden exceeds 65 dB run an approximately 15-25 percent higher risk of cardiovascular diseases compared with subjects that live in comparably quiet areas. With respect to high blood pressure the risk tends to be larger for aircraft noise compared with road traffic noise which may have to do with the fact that people do not have access to a quiet side when the noise comes from above. However, the number of aircraft noise studies is much smaller than the number of road traffic noise studies. More research is needed in this field. Nevertheless, the available data provide information for action taking. The decision upon critical noise levels and “accepted” public health risks within a social and economic context is not a scientific one but a political one. Expert groups had concluded that average A-weighted road traffic noise levels at the facades of the houses exceeding 65 dB during daytime and 55 dB during the night were to be considered as being detrimental to ill-health. New studies that were able to assess the noise level in more detail at the lower end of the exposure range (e. g. including secondary roads) tended to find lower threshold values for the onset of the increase in risk than the earlier studies where noise data were area-wide not available (e. g. only primary road network). Based on the current knowledge regarding the cardiovascular health effects of environmental noise it seems justified to refine the recommendations towards lower critical noise levels, particularly with respect to the exposure during the night. Sleep is an important modulator of cardiovascular function. Some studies showed stronger associations of cardiovascular outcomes with the exposure during the night than with the exposure during the day. Noise-disturbed sleep, in this respect, must be considered as a particular potential pathway for the development of cardiovascular disorders. The WHO (World Health Organization) Regional Office for Europe is currently developing a new set of guidelines (“WHO Environmental Noise Guidelines for the European Region”) to provide suitable scientific evidence and recommendations for policy makers of the Member States in the European Region. The activity can be viewed as an initiative to update the WHO Community Noise Guidelines from 1999 where cardiovascular effects of environmental noise were not explicitly considered in the recommendations. This may change in the new version of the document. – Babisch, W. and I. van Kamp (2009). Exposure-response relationship of the association between aircraft noise and the risk of hypertension. Noise Health 11 (44): 149-156. – van Kempen, E. and W. Babisch (2012). The quantitative relationship between road traffic noise and hypertension: a meta-analysis. Journal of Hypertension 30(6): 1075-1086. – Babisch, W. (2014). Updated exposure-response relationship between road traffic noise and coronary heart diseases: A meta-analysis. Noise Health 16 (68): 1-9. – Vienneau, D., C. Schindler, et al. (2015). The relationship between transportation noise exposure and ischemic heart disease: A meta analysis. Environmental Research 138: 372-380. Note: Study-specific reference values were pooled after conversion to Lden using the derived meta-analysis weights of each study (according to Vienneau et al. (2015)).